Looking for a gift for that special someone? Whether you're shopping for a seasoned cyclist or for something to entertain the little one, we've got a wide range of exciting and unexpected gifts to help make those special occasions sparkle. You are now able to add your Halfords Gift Card into your mobile wallet on Apple devices. Instore you simply show your Gift Card in the wallet and the cashier will scan the image barcode. The top left of the mobile pass also shows you your balance in real time* (mobile data or wifi connection is required for realtime balance). To qualify you must either already have, or purchase a Gift Card or eGift redeemable in either Halfords, The Boardman Performance Centre, and Cycle Republic with an active balance. This is valid in the UK and ROI for both Gift Cards and eGifts of any age or value. 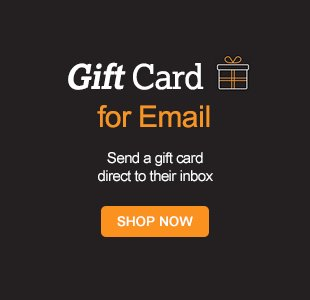 Online - purchase your Gift Card / eGift as normal, and then follow the instructions by device below. Instore - Purchase your Gift Card as normal, and then follow the instructions by device below. Mobile wallet is available in England, Scotland, ROI, and Wales. To be eligible a customer must have a Gift Card or eGift with an active balance on it. This can be one you already have, or a newly purchased one. 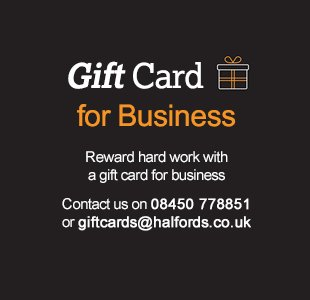 Applies to Gift Card and eGifts redeemable within the Halfords group only. Exclusions include but are not limited to Love2shop, one4all, Cycle choice, Spree, Olio, Jam card, Pure card, From me 2 you. Paper Gift Vouchers are not eligible for mobile wallet unless they have been received digitally as an eGift. No alternative is available if you are unable to add your Gift Card / eGift to your mobile wallet.